If having to have ps+ or xbox live is an issue for you, you will not like the current state of video games. Wait til you find out there is stuff locked on your game until you pay for it! ( they call it DLC ) Welcome to the future! Jason's mask is knocked off. It's safe to say that the match has been going long enough for him to be enraged, making his abilities fill faster. My theory is when you ran outside by fuse box, he spotted you with sense. When you ran back in the cabin and ran by fire place to grab trap, he shifted in thinking you turned through the door. ( easily confused by sensing you and when you ran back in, whole cabin turns red. So he cant tell what way you ran) While he is in the room he thinks you are in, you go back to broken door room and close and lock door placing trap. Unknown to you hes already inside. You hear his music thinking hes outside, but hes in bedroom and comes out of stalk. Unknown to him that you are in broken door room now and soon living room, he starts searching bed. Rage refills and he enters stalk again. You not realizing hes already inside, walk to the direction hes heading, catching you off guard. Kill follows. So that Facebook post about Kane dressing up as Sav and retro jasons, The retro Jason was using a J6 recolor. Is this possibly something to do with the rework or is it just that the post that they re-shared used an unofficial pic? I felt bad leaving behind the guy that Jason was chasing, but if I had stopped we both would of died. I finaly got it to count. I had to do the cemetery fence kill again for some reason. I recently had a problem with PSN. Is there a red x near your avatar? I couldn't do any functions like play multiplayer or redeem ps4 codes until I fixed it. Maybe you purchased it while the network was experiencing problems and it hasn' synced up to your PSNaccount? Is it possible he had the glitch where your kills don' light Up? Maybe he didn't know to walk into the water? anyone notice this on the 150 annnouncement ? Yea I just got done reading up on that. So newline would have no claim to remake. But looking at the credits in game , I see no mention of new line at all. If I'm understanding this correctly, Sean cunmingham and horror inc still own all the original 1-X rights until mid 2018 when it reverts to warner/new line. So if they are using stuff they have already had licensed from s.c./ horror inc, why the mention of new line? And if they have mentioned new line in credits before, when?
" 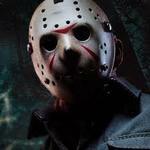 Friday the 13th and related characters and elements are trademarks of and New Line Productions,Inc. and Horror Inc. (each to the extent of their interest) " Now I'm not 100% sure how the whole license deal they have works, but this is the first time I have seen them give credit to New Line. To my understanding, unless it involves FVJ, the Remake, or using any character or element for toys or merchandise, they didn't have to include New Line?? So does this mean we are getting some FVJ or Remake content? Or maybe using the NECA NES Jason and having the music requires New Line shout out? Exactly how I would of pit it. Would remove hair from pt2 model. There are 3 packanack lodge doors. 2 on porch side facing lake and 1 facing car near living room. What are you calling kitchen? Surely you don't mean the interior kitchen door? Anyway not picking on You, just wanted to know if you were accidentally locking people out on backside. When you commented that you disagree that you lock doors at main lodge to hear for a sound que, that was the door in question. You never said I lock all doors except that one.